Proudly providing ADA Signs to Raleigh, Cary, Apex, Fuquay Varina, Holly Springs, and surrounding areas. The Americans with Disabilities Act (ADA) ensures that those with special needs have access to public places and facilities. Many people think the Americans with Disabilities Act, or ADA, just refers to Braille or raised lettering on directional signs. 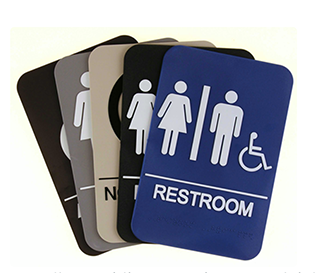 But the ADA sign standards address all kinds of physical handicaps and complying with the guidelines may affect the specifications for nearly all of your Raleigh NC facility's architectural signs. We offer a complete range of ADA compliant signs, and will be happy to guide you through the process of selecting and placing the right ones. Let us be your experts on ADA signage. Give us a call today at our Apex NC sign facility for a free consultation.